Created from domes of French lead crystal, Maria's custom paperweights are perfect for a desktop or dresser. Watch how Maria magically transforms your treasured sentiments into miniature works of art. These are great gifts for all occasions and are well suited for office desks and credenzas where wall hangings may not be wanted or allowed. 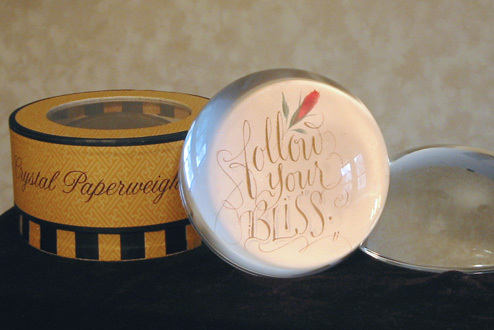 Paperweight domes are 3.5 inches in diameter and 2 inches high (9 x 5 cm). Because these domes magnify what's underneath, Maria has a 2 inch (5 cm) diameter space to write in, so plan your words accordingly. Here are a few more samples. © 2019 Maria Thomas. All rights reserved.